Can falling in love help you lose weight? According to Nancy Bryan, author of Thin is a State of Mind, The No-Stress Weight Loss Guide, the answer is yes! Easier said then done, and what if you are not looking for love and still want to lose? 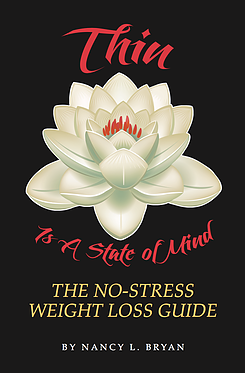 Then Thin is a State of Mind is a book you will want to read and Author Nancy Brian is offering my readers one to giveaway. Keep reading on how to enter the giveaway. Thin is a State of Mind is emphatically not a diet book but a problem solving book, thus should be read before attempting any weight loss. The value of the book is that it demonstrates how one solves problems better if one can manage to bypass the anxiety-ridden thoughts produced by the conscious mind. Anyone who has ever tried and failed at losing weight deserves to be given the mental tools to help achieve success the Thin is a State of Mind offers. • How anxiety can make you fat – and what can be done to prevent this. • Why it is that falling in love is one of the best weight-loss tricks there is. • Why happiness makes people thin, not the other way around. • Why weight loss is a time of learning for the body; how to stop “trying” to lose weight and let the body do its job rather than getting in the way. • What weight loss has in common with surfing. Thin is a State of Mind helps readers embark on the path toward these inner, and then outer, changes. It gives readers the minute details of how, exactly, to encourage the body to become healthy from the inside out. It includes methods such as relaxation or meditation, as well as effective approaches to achieving digestive fitness and body awareness. To enter the giveaway, please share a comment below. It can be anything related to dieting wether you have a great tip to share, how many diets you have tried, what your vice is, (mine is key lime pie) or anything else you would like to share. Last day to comment to enter the giveaway is Tuesday, July 24, 2018. Winner is chosen in order of comments by random.org. Winner will be notified via email and the book will be shipped directly from the author to the winner. Nancy Bryan, Ph.D., author of this revised and updated edition of Thin is a State of Mind (first published in 1980 by Harper & Row, and subsequently by CompCare Publications), has spent her entire working life as an editor: in the sixties at The Rand Corporation; in the seventies at an ARPANET research institute; in the eighties at a worldwide employee-benefits consulting firm; and in the nineties for the J. Paul Getty Trust. In addition to Thin is a State of Mind, Bryan has written a doctoral dissertation on the poetry of Elizabeth Bishop, and has ghostwritten a bestselling self-help book. Her work has appeared in Vogue, Self, Family Health, and various museum and computer-science publications. She is currently working on a forthcoming title, Metathinking: Working Knowledge for Women. I am always interested in ways to shed pounds. As I age, it gets harder for me.